Almost all Mosques are attended by, and their programs geared for, born Muslims. Almost all Mosques are attended by, and their programs geared for, born Muslims. The two discussed the growing number of people who accepted Islam during the past Ramadan and the importance of doing something for them that is social, educational as well as fun. 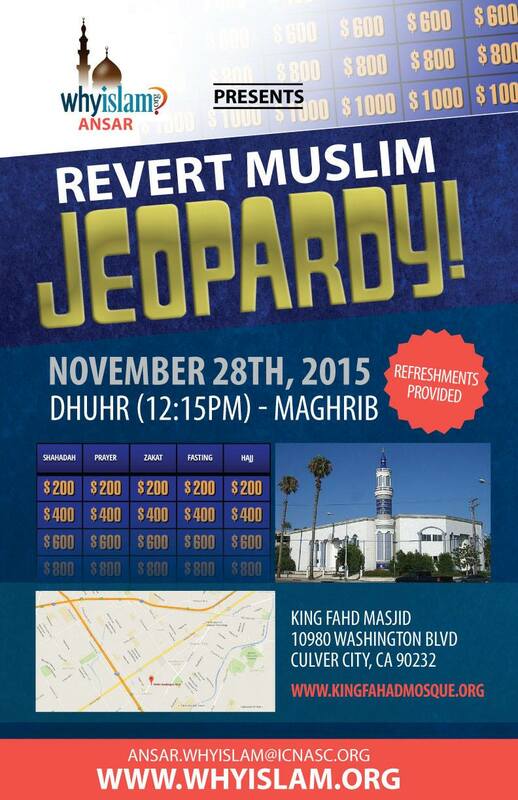 It didn’t take long for the local ICNA outreach volunteers to decide on “Revert Jeopardy”. Putting together the questions for the jeopardy turned out to be the biggest task. “We were not sure if they would be too easy or hard. We asked Reverts who have been Muslims for at least 10 years for assistance.” said Mohammad, one of the organizers of the event. But soon enough things started to fall into place: budget was approved, flyers were designed, printed, and distributed at local mosques. Social media and emails were used to get the word out. The most effective invitations appeared to be those extended personally by the Mosques. The attendees, almost all of who were reverts, had a great time and expressed interest in new Muslim classes which the team is finalizing with the King Fahad Mosque in Los Angeles. The organizers state that they are ready to help any chapter of ICNA in organizing similar event. A new Muslim seminar is also being organized at the Institute of Knowledge in the city of Diamond Bar on January 31st, 2016.